The project is implemented on a pilot scale, covering a total area of 150-200 ha, including tree regions in South Greece (two on Crete and one in Peloponnese). A total of 80 farmers participate in the project, registering 600 of their parcels, as well as 3 advisor- agronomists (one per region). The aim is to create a comprehensive package of treatments for wastes from the two-phases olive oil extraction. The targets are to develop a catalogue and a data-base for processing technical and economic information, to improve the recovery of orujo oil and alpeorujo drying to obtain better oil quality and reduce costs, to validate alpeorujo by protein optimisation to obtain animal feeding, by aerobic bioremediation of liquid and solid phases to obtain plant growth promoters, and by combustion/gasification to recover energy and combustible gases. The package of treatments will be hopefully the most efficient, most economical, and most feasible for olive oil industry to use. The proincipal objective of the ECOIL project was to design and to implement a Life Cycle Assessment (LCA) for the full cycle of olive oil production in three Mediterranean countries, Greece, Spain and Cyprus. The existing situation was recorded and assessed in order to develop the appropriate LCA methodology, so that certain coefficients for each stage of the process (e.g. olive trees cultivation practices, olive oil production process, olive oil mills waste management systems and olive oil marketing) were developed. The implementation of the LCA allowed the derermination of the potential impacts to the final product, the environment, the public health, as well as to the operational cost. The implementation of this technology allows for the assessment of the production stages that can be redesigned and improved, so that a more sustainable olive oil production was achieved. Improvement through a training program of olive mills' and table olive producers' technical competence and competiveness. The main intension of the project's partners was to create a fluid communication network between all elements involved in the industrial and commercial processes of the sector (from the producer to consumer) and to reach as many European SMEs as possible in order to assist them. The programme was financed by the EU Regional Development Directorate-General (ERDF Innovative Actions 2000 - 2006, Programme 2001 GR 16 0 PP 209) and its mission was to develop innovative actions on the North Aegean islands. 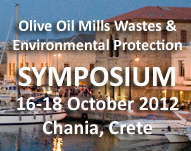 The specific goal was to set up pilot waste management systems on a number of olive mills in the North Aegean Region, ultimately aimed at defining integrated solutions to the olive mill waste management problem. These solutions took into account the specificities of each individual olive mill and tap on existing knowledge available of the technologies that have already been tested on the global scale, while aimed to test innovative techniques and strategies. Emphasis was placed both on the production process that produces the waste in question, thus on minimizing the amount of waste that was produced, as well as the treatment of the waste produced. Thus, the aim was not to find the one and only solution to the waste management problem, since the optimal solution in each case most probably was dependent on the specificities of the particular olive mill (e.g. varying degrees of land availability, different production capacities etc.). EnviFriendly is a succesfully completed LIFE05 project. The premise of the project was the following: “The selection, design characteristics and implementation of environmental friendly technologies for the minimization of non-point source pollution from agricultural lands should be conducted in conjunction with the development of watershed and coastal zone management plans.” There is a need to integrate the design of environmental technologies with the watershed management plans. The objective of the project was the demonstration of a “toolbox” of environmental friendly technologies for the minimization of non-point source pollution from agricultural lands and integration of their design in the watershed management plan of the Evrotas river basin and its coastal zone. This project was in line with the Rural Development Policy of EU regarding the objectives of axis 2 (land management/environment) and specifically the agri-environmental measures. The main purpose of the demonstration project Life Olèico is the construction and start-up of a prototype of a phytoremediation facility patented by ISRIM and the propagation and diffusion of this new scientific approach in order to introduce it into the law in force as afficial method for the disposal of olive mill wastewater. This plant is meant to provide the olive oil producer with an efficient, eco-compatible disposal system of easy application for the agricultural operators. The utilization of biomass and humidified organic matter could furthermore guarantee a profitable return. The aim of the project is to promote sustainable production and consumption standards, having olive oil as an example, in order to diminish environmental problems especially in areas where olive oil is produced. The results of a previous LIFE project (ECOIL, LIFE04 ENV/GR/110) which evaluated the environmental effects of the different stages of olive oil life cycle and proposed specific measures for the prevention and minimization of related problems will be disseminated; Education and training concerning the measures that can be taken in order to diminish the environmental problems caused by their activities will be offered to producers, consumers, government & local authorities and other related organizations; Ecologic production of olive oil will be promoted in general. The two main target audiences are consumers and producers. Consumers will be informed about the importance of sustainable production and the biological products. Producers will be informed around several aspects regarding the cultivation and production phase. Among others, this project aims at recruiting new producers and attracting as much as possible consumers.